We’ve been writing a lot more about diet culture these days. And while a lot of us are on the fad-diets-don’t-work-and-aren’t-worth-it train (choo, choo — and yay, yay! ), it’s important to be aware that diet culture is sneaky. And it’s everywhere. And there are loads of ways for it to work its way into our lives (and heads) without us even knowing it — and that’s what we want to dive deeper into right now. Because, not to be dramatic, but this is the stuff that affects our daily lives, choices, and even our self confidence (not to mention our ability to give ourselves unconditional self-compassion). And, as you all know, you can’t hate yourself healthy — it all starts with self-love. So, yeah, you could say it’s important. Like, REALLY important. That’s why we’re creating a primer on exactly what diet culture is. You can’t get out of something if you don’t see it or even know what it is. So, let’s take a closer look! There is A LOT of good stuff written about what diet culture and diet mentality is and how it presents itself in our everyday lives. We’re not going to try to recreate or even touch that work (although we’ll share a couple of links in a sec). Much of what’s out there is done by some incredibly talented and smart women who are far more expert and qualified in this area than we are (in fact, like I said in this video, we’re still learning ourselves, and we’re committed to improving our content so that it’s truly non-diet). In a nutshell though, diet culture is the idea and societal belief and expectation that your value is determined by your looks, body shape, or body size, regardless of health or well-being. For more in-depth reading, read this awesome post about Kate Browne on what diet culture really is (she breaks it down perfectly) and this illuminating post from In It 4 the Long Run. Like we said, diet culture is SNEAKY — and it’s big business. Like, $40-billion-plus big business. While marketers have gotten the message that dieting is out and self-love is in, now, much of diet culture is often masked as body positivity, “health,” or even “feeling good.” But, again, go back to that definition of what diet culture is: If looks, body shape, or body size, are being put ahead of of actual health and well-being (being physical, mental, and spiritual) — in ANY WAY — then, boom! You’re looking at diet culture. Don’t let “health” claims fool you, either. Health does not come in a specific size, shape, or look. For more on that, check out the Health At Every Size movement here here and this fact sheet. In case you missed it, here’s how to spot diet mentality in yourself and your own actions. 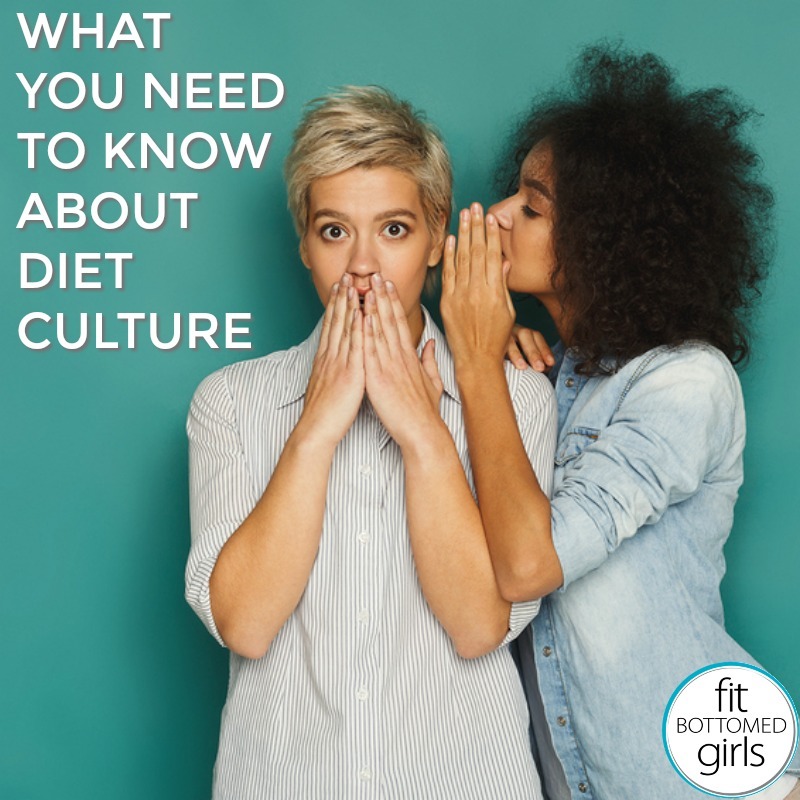 So, now that you have a quick primer on what diet culture is, you’re probably feeling all fired up and want to do something to help, right? Right. Here are some ways you can help fight diet culture with us — because, yes, it all starts with US! 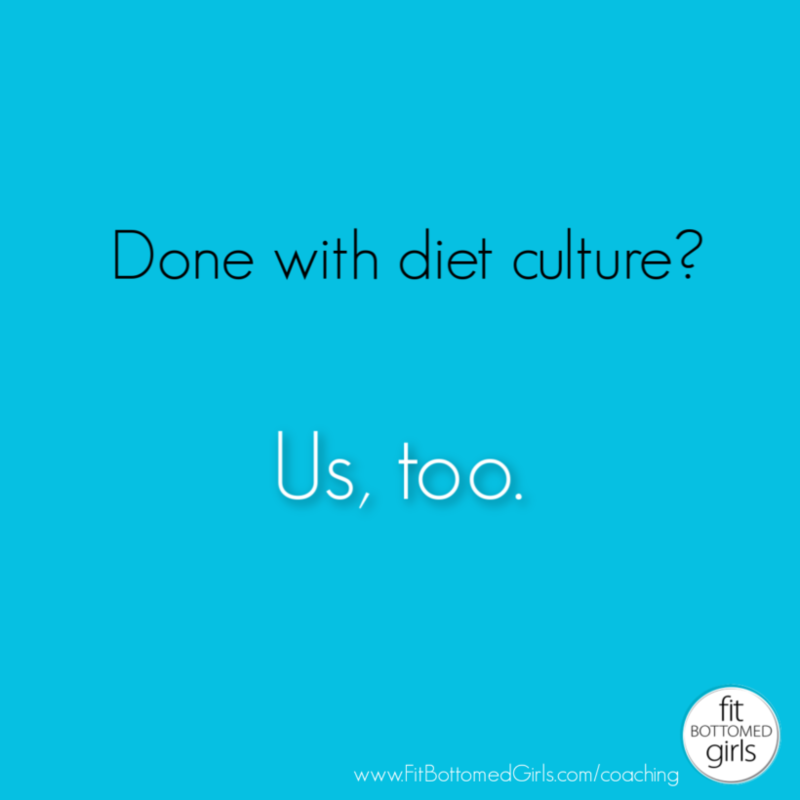 We are D-O-N-E with diet culture and diet mentality. And hope you’ll join us! Because feeling really good, taking your power back into your own hands, and trusting your body and yourself? Well, that is health-boosting, life-changing awesomeness that we ALL deserve. Helpful article! I have just begun a diet plan recently and but it seems not working for me. And fortunately, my sister share me your blog, such useful tips & infor! Thanks so much! I love the whole diet culture tips…I am definitely following them !! Great collection of blogs.Like all the blogs you have shared. Really helpful for those who want healthy and fit lifestyle. Thank you guys for sharing this! I have a long history with yo-yo dieting, getting on and off and trying different methods that are market very well. This all left me feeling even more ashamed of my body and ultimately lead me to develop gut issues. Every time I ate something that I though was not “healthy” or made me lose weight, I got severe cramps and bloating. It became so bad that I couldn’t eat anything at all anymore. I still find myself sometimes intrigued by diets that are promoted such as recently the bulletproof/ketogenic diet or intermittent fasting. Just to realize that all of that is not sustainble and just feeds my obsession. Now I’m making a conscious effort to learn to listen to my body and its needs again. It’s a slow process but one that will ultimately help me to enjoy life and food again. Keep up the amazing work!